Our Land Rover Defender 7" LED Headlights with Halo are specifically designed for use with Land Rover Defenders. 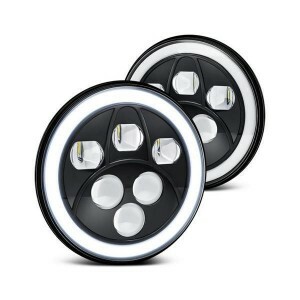 The anti-flicker harnesses prevent radio interference and contain technology that eliminates flickering caused by the CAN-BUS electrical system on later models making these headlights simply plug & play drawing a mere 2.0 Amps for each 30/36 Watt light. Our LED Headlights offer 4000lm (High Beam) /2400lm (Low Beam) and are easily adjusted using the standard Land Rover headlight adjustment bezels. Instantly upgrade the look of your Defender with our road legal & E Marked LED lights.